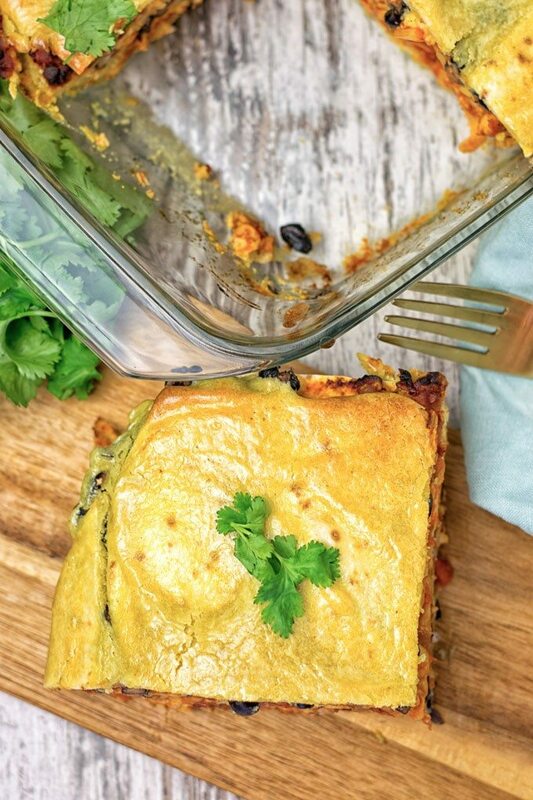 This Easy Vegan Taco Lasagna is my take on a Mexican Lasagna. 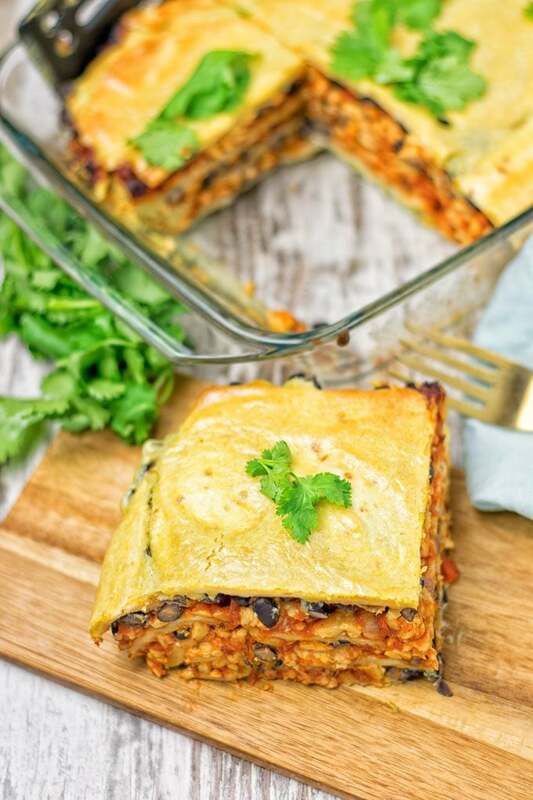 It gets amazing flavors from a homemade tempeh red sauce and a delicious dairy free cashew sauce. Also it is gluten free, requires only 5 ingredients. Comfort food that is kid-friendly and family-friendly. Perfect for meal prep and for making something with leftover taco meat (plant-based, of course). You know already that Mexican inspired food is one of my all-time favorites. Easy recipes like the Mexican Street Corn Potato Casserole, Healthy Mexican Cheese Rice, or the Mexican Quinoa Wraps are just three of the many examples you can find on Contentedness Cooking. You know I could live of this style of food and could eat it almost every day. I’m also all about casserole dishes. Simple things you can put into a dish and bake. Super easy and done. It’s definitely too long ago that I’ve eaten a Taco Lasagna. I could remember before vegan days there was a Mexican restaurant in the city and this was definitely a dish I ordered several times. Basically it was kind of lasagna but with tortillas, layered with a hearty meat sauce and a creamy, heavy cheese sauce. I found to so satisfying and delicious at the time. But for now obviously I wouldn’t eat that. So I had to recreate this in a plant based way. Instead of meat say hello to an outstanding and finger licking good tempeh Bolognese sauce. Simply a dream come true. 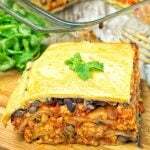 By making this Easy Vegan Taco Lasagna you can expect a result that is absolutely satisfying, flavorful, made for company, potlucks, Mexican nights or just when you want seriously good food. 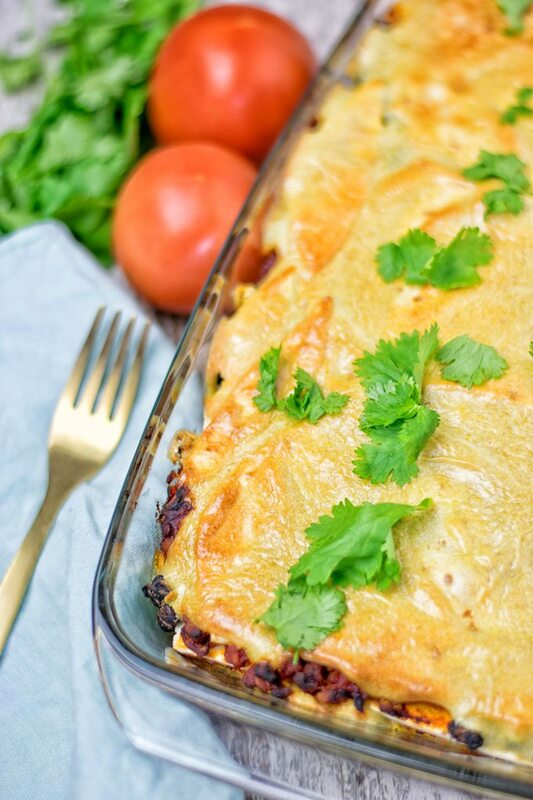 Creamy, cheesy, hearty, addicting, drool worthy and so mouthwatering. First prepare the black beans according the directions in my Mexican Fiesta Cauliflower Rice but add 4 extra cloves garlic. Spice up the prepared tempeh Bolognese with hot sauce. When you also have prepared the Vegan Cheese Sauce, it’s time to assemble: start with cheese sauce to cover thinly the bottom of a casserole dish. Next come tortillas, followed by tempeh Bolognese and beans. Add cheese sauce, then repeat this three times. 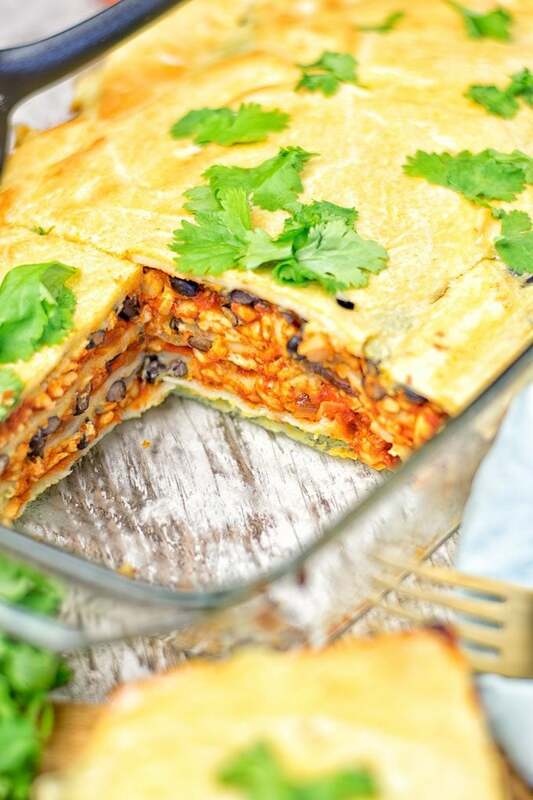 Finish with a top layer of tortillas and a good amount of the vegan cheese sauce. Finally bake in the oven for 20-25 minutes at 360°F. Some words about this sauce: You would guess we need nutritional yeast here, but this time you don’t have to use that. I’ve been so surprised when I created this sauce. It can mimic a real cheese taste so close to the real deal no one would guess it’s without any real cheese. Plus it is so super easy. The magic ingredients are tahini and vegetable broth, which in combination truly create this taste. I can say you will have a hard time trying not to eat the sauce before this lasagna is done. So maybe better be prepared to make a double batch to be safe and have enough! Seriously that stuff is super addicting and good on sandwiches, wraps, burgers over salads and heck yes so many options. 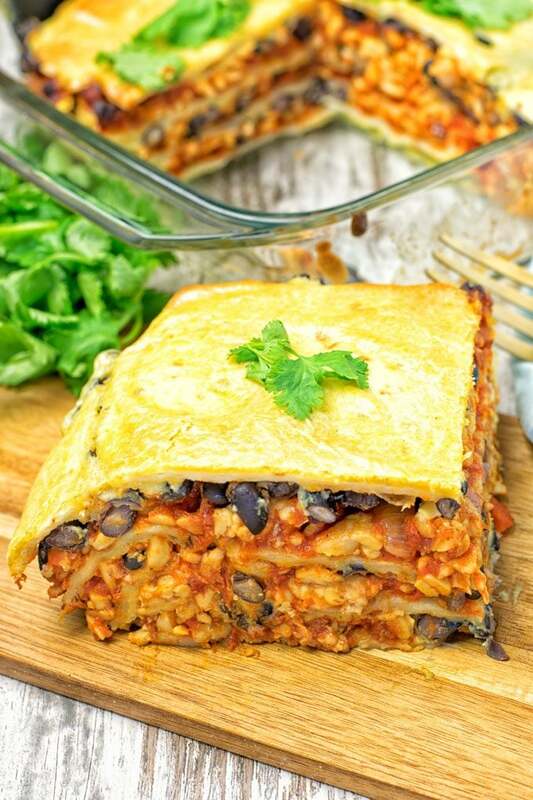 The Easy Vegan Taco Lasagna makes an amazing dinner or lunch. But you can also bring it to parties or potlucks, you will surely impress everyone. I made this recently for a party and it was devoted in no time. Even the meat eaters were surprised how meaty and cheesy it tastes, made with just 5 ingredients and in 2 easy steps. I mean you can beat that, who doesn’t love a comforting cheesy and meaty dish? Just because I’m vegan doesn’t mean I can’t have that. Let’s have a look at the ingredients. Cashews are not only delicious, they are also high in vitamins, minerals, and anti oxidants like selenium and copper. They lower high blood pressure, and help with healthy bones and teeth. Tahini is rich in minerals like phosphorus, magnesium, potassium, iron and an amazing source of calcium. Full of protein and high in unsaturated fat – that’s a good one! Black beans are high in fiber, protein, and vitamins. So they are meant to be really power beans. And last but not least tempeh: rich in protein, copper, manganese, it contains probiotics which have a lot of anti inflammatory benefits. Give this a try tag me on Instagram and Facebook so you I can see all your remakes. Make a picture and say hello, see you soon Florian. So does this bake in a 9×9 dish? Hi Deb! 9×9 will work! Okay, thank you. I am making this dish for dinner one day next week.